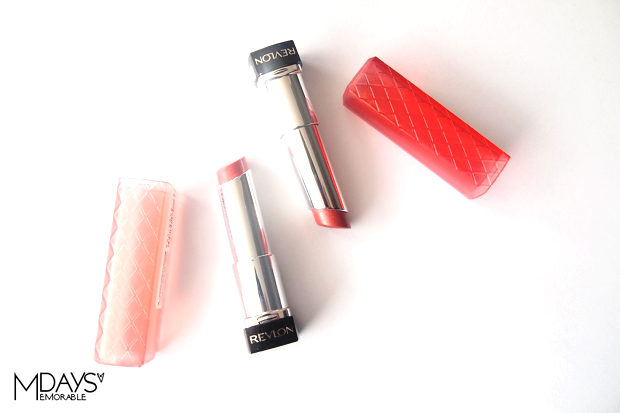 Review: Revlon Lip Butter - Peach & Macaroon | Memorable Days : Beauty Blog - Korean Beauty, European, American Product Reviews. 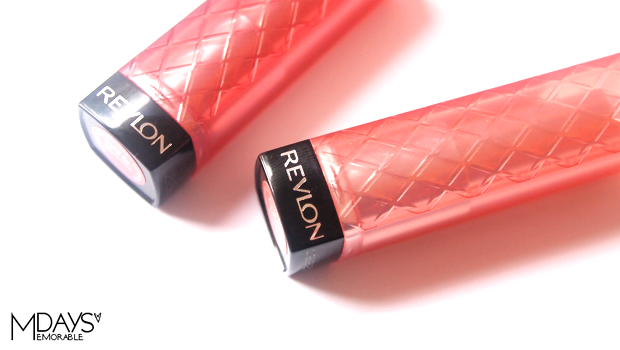 Oh my, why am I reviewing these revlon lip butters so late? It was a very popular product in 2012, why am I reviewing this in 2013? The reason for that is because it's barely sold in The Netherlands. I know that they are sold in some drugstores here, but I need to travel a bit far to get it. Therefore I wasn't able to try these lip butters from Revlon until my London trip in December. I bought 2 lip butters at Boots and I will be reviewing these today. It's a buttery balm with a beautiful shiny color to give you baby soft, moist and healthy glowing lips. They are sold in 20 shades and they all have cute and sweet names. 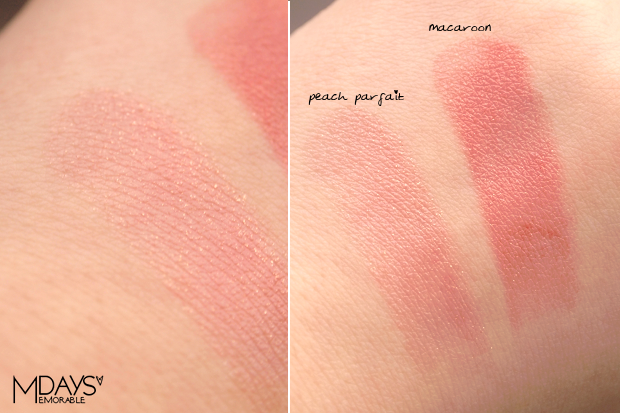 I bought the shades Peach Parfait #025 and Macaroon #096. I've swatched the whole lip butter collection in the drugstore but I liked these 2 shades the most. You can get these at their online store www.revlon.com, Ulta, Target, Superdrug and Boots. In The Netherlands you are able to get it at selected DA Drugstores and at online stores like www.parfumania.nl. The prices are between €8.- to €11.- it depends where you buy it. I really love the packaging because it looks slightly classy and you are able to see the color of the lip butter through the top of the cap. I will be showing you some swatches. The colors below are true to the real color. As you can see peach parfait has golden shimmer and tiny gold glitter particles. It's a very natural color with a little bit of color pay off. The color is peach/light pink. It's moist and it is suitable for daily wear. 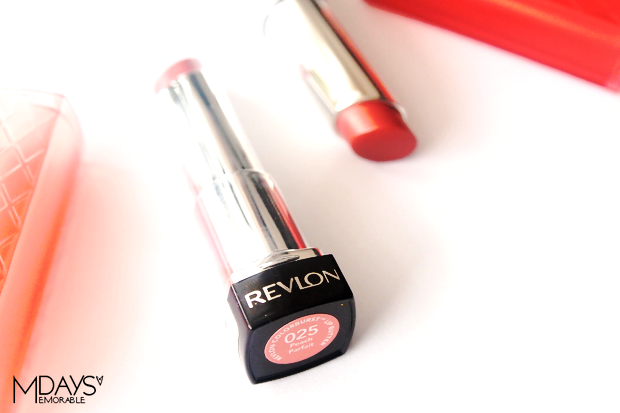 Macaroon is a red lip butter that doesn't stand which makes it a more natural looking color. It has a little bit of shimmer and it has great color pay off (better than peach parfait). Both lip butters have a mild butter scent which is pleasant, not overwhelming. 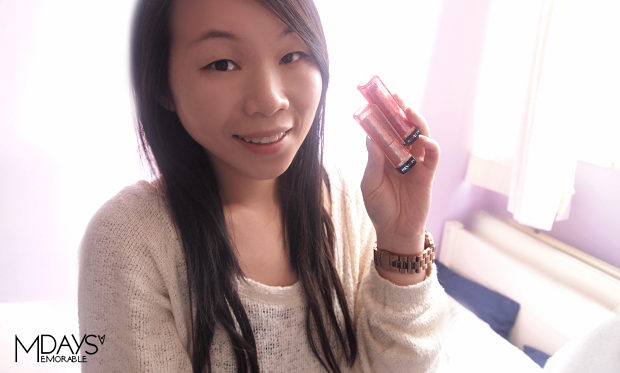 I love both colors but Peach Parfait is really my favorite and it's suitable for every day wear. It will make your lips polished and its so easy to apply. I'm also surprised that the color pay off is good and that the lip butters are mild scented. Most of the lip products that I've tried have a weird smell to it, but this one has a pleasant mild butter scent. They are also feeling moist on the lips but unfortunately it won't able to heal your chapped lips. It's moist but not moist enough for extremely dry lips. Besides, it's a pity that the color doesn't last long and it will get off easily when you drink something.